Most of the schools in our district are in the process of being transformed into New Tech Network schools. NTN works with schools and districts to, "transform schools into innovative learning environments." NTN schools are designed to support students so that they can, "think critically, manage their own learning, collaborate and communicate effectively." A key pillar in the New Tech Network model is the use of NTN grading outcomes. These are research-based outcomes aimed at preparing students for college and careers in the 21st century. NTN has developed rubrics for each outcome, and regards the use of these rubrics as an essential part of project and problem based learning. ​ Click on the titles to see the middle school rubric for each outcome. 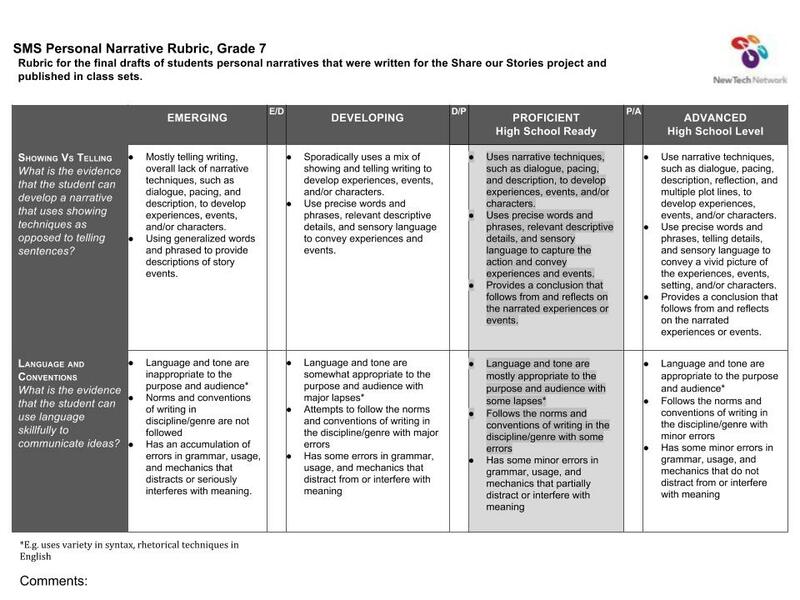 Here's an example of a rubric that my partner teacher and I adapted for our Personal Narrative Project. These students were assessed using the Collaboration and Oral Communication rubrics.